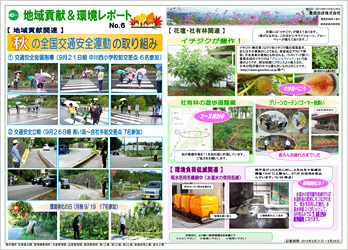 Environmental Efforts at Affiliated Companies | Toyoda Gosei Co., Ltd. Steady efforts to reduce energy consumption and waste and contribute to environmental protection and the community. TG Fluid Systems USA Corporation (TGFSUS) manufactures plastic fuel and vapor lines.Its primary facility is located in Brighton, Michigan, a suburb of Detroit, with a secondary plant 15 miles away in Howell. TGFSUS also had a third plant that housed the company’s testing lab and some assembly equipment, but those processes were incorporated into the primary facility in May 2017. To reduce CO2 emissions, TGFSUS reclaims the heat generated from the compressor house and uses it to heat the plant during the cold winter months, reducing CO2 emissions by 32% in 2016. TGFSUS is also switching to LED lighting from conventional light sources in many areas within the company, cutting CO2 emissions from lighting by 87%. The plant consolidation mentioned above will improve material flow and allow the company to reduce logistics loss by reviewing truck routes and allocation, and greater adoption of LED lighting in the company will lead to further reductions in power consumption and decreases in CO2 emissions. To reduce waste, TGFSUS has worked with its largest supplier to develop and begin using returnable shipping containers made of plastic instead of cardboard boxes, eliminating the use of cardboard shipping boxes.To reduce scrap in production processes, TGFSUS ensures that all levels of the organization understand where scrap is occurring and seeks employee’s ideas to correct issues. TGFSUS is working with Toyota Motor North America OMDD (Operations Management Development Division) to create a model production line to increase efficiency, reduce scheduled downtime and reduce defects. 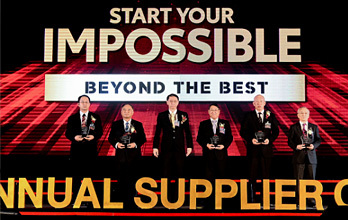 These activities led to the receipt of a Quality Performance Award for the third consecutive year from Toyota Motor Corporation. 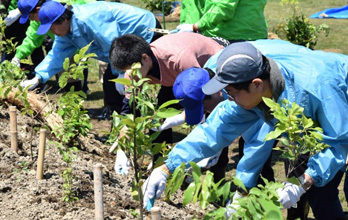 June is Environment Month in the Toyoda Gosei Group, when Group companies undertake activities to raise environmental awareness among employees. TGFSUS displayed posters throughout its facilities encouraging recycling and held an electronics recycling contest in which individual employees brought in electronic goods they no longer needed for proper recycling. 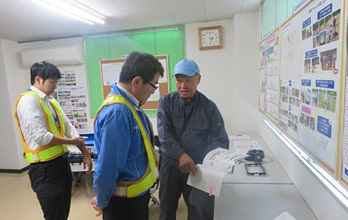 It also established its own Green Day on June 23, when employees picked up trash in zones around the plant and conducted various other environmental activities. TGFSUS contributes to the community through support of the Livingston County United Way, an organization that seeks to elevate the quality of life of all community members, and received a Livingston county United Way Corporate Excellence Award for volunteerism and contributions. Over the past several years the nearby city of Flint has experienced a crisis of water supply contamination, and out of concern for the health of employees living there TGFSUS has provided water filtration purifiers that can be attached to home faucets and set up an onsite filtration system for water that employees can take home with them. TGFSUS’s activities were recognized with an Environmental, Health & Safety Global Supplier Award from major customer Kautex in 2016 and a Work Skills Corporation Employer of the Year award for employment opportunities provided to individuals with disabilities. This social recognition will serve to motivate further environmental and corporate citizenship activities in production and engagement with the local community. Toyoda Gosei Interior Manufacturing Co., Ltd. Balancing environmental preservation and efficiency with wisdom and ingenuity, this company promotes environmental activities in terms of both systems and structures. Toyoda Gosei Interior Manufacturing Co., Ltd. is a maker of plastic interior and exterior parts for automobiles located east of Nagoya in Togo, Aichi-gun. Near several Toyota Motor Corporation factories, the company is characterized by direct delivery of nearly all products. It conducts environmental impact reduction activities with the main focuses on reducing CO2 emissions and waste in production, while also conducting activities to contribute to society. In reducing CO2 emissions its efforts have been focused on effective use of production space. Since increases in processes with production increases leads to increased energy use, they have devised tooling so that multiple product types can be run on a single line. By making general purpose lines, the energy used per unit of space is decreased. The factory roof was painted with a thermal barrier coating in FY2015, lowering the temperature inside by about 2°C. In addition, CO2 emissions have been cut 5% through efforts to control and minimize the number of compressors in operation depending on the load. To cut waste, they introduced stricter management of dies in FY2016. The establishment of a dedicated maintenance area and planned maintenance based on a chart prepared for each die or mold has enabled preventive maintenance, and reducing sudden defects has cut the amount of waste 30%. When purchasing new dies, they work with the die manufacturer to check measures for problems that have occurred in past manufacturing in order to create dies with great precision. Through close examination of the intake of dust, a cause of defects in painting processes, and trial and error for thorough cleaning, they achieved a defect rate at the 1% level. Waste has been reduced 2.4%. These activities are done mainly by employees. A cycle is maintained in which employees work out measures to reduce defects and the transition to execution as they raise each other’s awareness. They have also set up an information sharing station, where they communicate problems at the start of shifts. 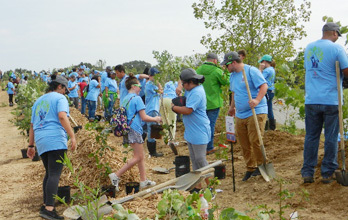 These activities are supported by the environmental awareness that reducing defects is linked to environmental preservation. In the future they will save energy by moving to electric fork lifts and updating transformers, while systematically increasing factory greenery. 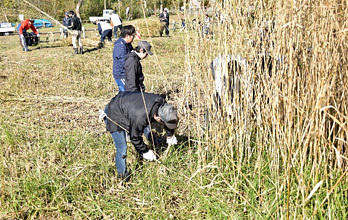 At the same time, they will work for a good balance, developing mid- and long-term plans for environmental activities and further raising employees’ environmental awareness. 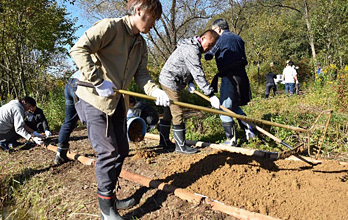 The company contributes to the community by cleanup of nearby roads. This is beneficial both in terms of the environment and society. Employees also stand watch for traffic safety on a school route near the company, and perform other activities for the community.